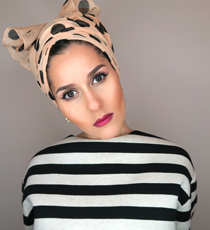 UK based blogger and mum Dina Torkia has a keen eye for fashion and all things beauty related. She creates weekly content for her hugely popular YouTube channel, ranging from styling tips and fashion hauls, to everyday lifestyle vlogs and passionate rants. Her YouTube channel has garnered attention and allowed her to dip into the world of presenting with her own BBCThree documentary that aired in 2015. Dina has previously collaborated with the likes of Liberty London, Monsoon, Neutrogena and most recently H&M and Revlon. Dina was part of YouTube’s #MadeForYou and #CreatorsForChange campaigns where she was selected as one of the UK’s most influential Social Media Stars of the moment and championed for using her voice to tackle social issues and promote awareness, tolerance and empathy. Furthermore, Dina was named one of the UK’s top 10 social influencers of 2017 by the Evening Standard.